Get intense protection daily with the Vichy 48hr Anti-Perspirant Roll On, a handy formula that leaves no white marks or yellow stains. The long-lasting anti-perspirant works to neutralise odour without harsh alcohol, and provides effective protection without staining clothes. The Vichy No Trace deodorant formula leaves no white marks and even helps to protect clothes from stiffening. Roll the 48hr Anti-Perspirant on to the armpit area after cleansing. Suitable for sensitive skin, alcohol and paraben-free. 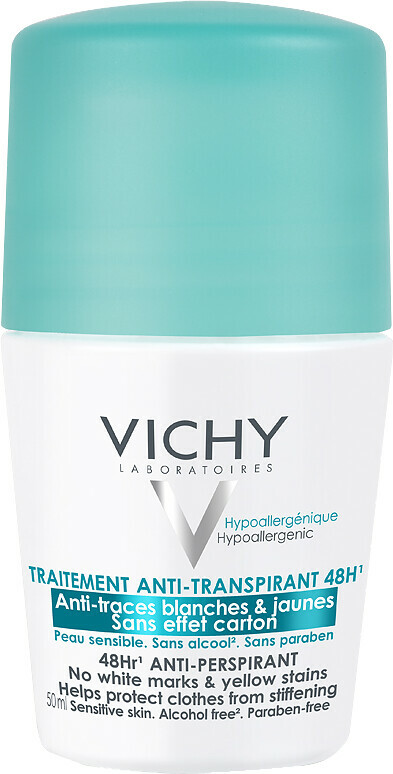 Vichy 48hr Anti-Perspirant Roll On - No White Marks and Yellow Stains 50ml is rated 4.3 out of 5 by 7. Rated 5 out of 5 by Lialia from Effective Lovely feeling on the skin,no white marks and fresh smell.And what is more important is very effective even in hot climate.Love it! Rated 5 out of 5 by Ewta35 from The best product The best product which I ever used. I would recommend this to my friend. Rated 5 out of 5 by Dreamer from The best anti-perspirant ever We used to use a Maria Galland deodrant until Escentual sent me a sample of this one. I have now ordered and reorded this anti perspirant for myself and for my husband. It is really great, does not irritate our skin, the smell is not overpowering, it just does its job and all of that at a very reasonable price. What more can you want. Rated 4 out of 5 by Alibi from Vichy roller So far so good. I've been using it for 2 weeks. Smells fresh, armpits stay dry for sometime (not when is super hot). Still to early to say about yellow clothes staining. Worth a try.